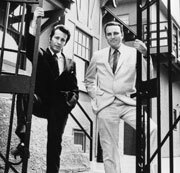 It's an archetypal story of the modern record business - two guys with a dream running their nascent label out of a West Hollywood garage in the summer of 1962. The label quickly gains momentum and eventually becomes one of the most important record companies the world has ever seen. Those two guys were Herb Alpert and Jerry Moss, the "A" and the "M" in A&M Records and they are stopping by The GRAMMY Museum for the latest installment of the Icons of the Music Industry series. As part of the 50th Anniversary celebration of A&M Records, hear Alpert and Moss in discussion about their last five decades in the music business, how they distinguished A&M as an artist-friendly label and what it's like being responsible for some of the most iconic releases of all time. After the discussion, moderated by GRAMMY Museum Executive Director, Bob Santelli, Alpert and Moss will take audience questions.